Humans focus on calories, fat content, sodium levels, and sugar amounts when looking at food labels. We enjoy eating a variety of foods but don't always want the result of consuming food: the ability to do more work. However, with livestock a profitable business centers on the ability for the livestock to work or produce. More milk or wool is good, better steak and larger burgers means a profit. So forage livestock managers look at food labels differently than the average American in the grocery stores. 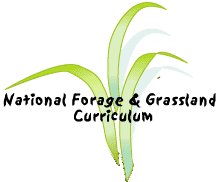 Forage quality was defined as the capacity of a forage to supply animal nutrient requirements. Those nutrients are many but the main components of interest are: calories (energy), protein, vitamins, minerals, and water. Energy is defined as the potential to do work. Energy can be measured in many ways, most commonly as calories in the US and the joule in international areas. A calorie is the heat required to raise the temperature of one gram of water from 16.5 degrees to 17.5 degrees C. One calorie = 4.184 joules. Animals use the calories to work in milk and wool production, gestation, and pulling or running efforts. Livestock feed should be high in calories. One calorie is very small so often kilocalorie (1 kcal = 1,000 calories) and megacalorie ( 1 Mcal = 1,000 kcal or 1,000,000 calories) are used. Energy could be measured as gross or total energy (E), but often the energy available for work is calculated after the energy lost in feces is subtracted. This is called digestible energy (DE). It can be expressed as an amount (kcal/g) or a percentage of the gross energy. Carbohydrates generally have 4.2 kcal/g of energy, while fat has 9.4, and protein has 5.6. With these figures total digestible nutrients (TDN) is calculated by totaling the digestible crude protein, digestible carbohydrates, and 2.25 X digestible crude fat. TDN is a commonly used measurement but not viewed as the best for ruminant animals. Once feedstuffs are consumed there are other ways that energy is lost besides defecation. The feedstuffs are exposed to microorganisms in the rumen so 3-10% of the E is metablozed to methane that escapes from the rumen as eructated (belched) gases. Three to five percent of the E is lost in urine. Subtracting these losses from the digestible energy leaves the metabolized energy (ME). Generally you can convert DE to ME by multiplying the DE by 0.82. The other common energy measurement often used is NE which refers to the net energy which expresses the amount of energy available to the animal for maintenance and production after some energy is used to metabolize the consumed food. It is calculated by using the heat increment (HI), which is the increase in heat produced as a result of digestion and metabolic processes resulting from increased ME intake. Subtracting the energy used in metabolization from the ME gives you the net energy (NE). The heat increment can be useful when animals are in cold temperatures and need heat to maintain normal body temperatures but often the heat is dissipated. Heat increment varies with diet and physiological functions of the animal so the range is from 10-90% of the ME. Net energy is used for maintaining bodily functions (NEm) and if enough is available, for producing new products (NEp) such as growth (NEg), milk (NEl), wool (NEv), and reproduction (NEy). Protein is another valuable part of forages. Proteins are complex combinations of amino acids which are necessary for synthetic processes essential to life. Amino acids are the building blocks of all cells and tissues including the blood, skeleton, vital organs, brain, muscles, and skin. Proteins are essential to lactating cows since milk solids are about 27% protein. Forages are tested for crude protein, available protein, unavailable protein, adjusted crude protein, and soluable protein. Crude protein (CP) is the most commonly used expression but absorped protein (AP) or metabolized protein (MP) may be more useful. Metabolized protein (MP) is defined as the true protein absorbed by the intestine. Many minerals are also important in determining the quality of forages. The 15+ minerals are catergorized as either macrominerals or microminerals. Macrominerals include calcium, magnesium, phophorus, potassium, sodium and chlorine, and sulfur. The microminerals are chromium, cobalt, copper, iodine, iron, manganese, molybdenum, nickel, selenium, zinc, arsenic, boron, lead, silicon, and vanadium. The minerals are listed as a percentage of the total sample taken for testing or in parts per million (PPM) for some minerals. For example, calcium may be .19% of the sample and there may be 172 PPM of iron. Since certain minerals may be toxic to livestock if found in large quantities and deficiencies may result in declining animal health and performance, mineral content should be considered in the quality of forage. Vitamins are vital for animals for various functions and needed to efficiently utilize other nutrients. Vitamin A, D, E, K, B12, Thiamin, Niacin, and Choline are needed. As with humans, supplements can be used but add to the expense of livestock feed. Lastly, water is needed by livestock and much of the water consumed is within feedstuffs. Water is vital for body temperature regulation, growth, reproduction, lactation, digestion, metabolism, excretion, and many other functions. Water needs will vary according to animal size, growth stage, location, and type of feed. Forages are tested for the dry matter content and moisture content to aid in determining quality. Corn grain is often used as livestock feed because it has a lot of calories. Other forages have lower calories but provide other valuable components.